Man with a Movie Camera (Russian: Человек с киноаппаратом, Chelovek s kinoapparatom — sometimes called The Man with the Movie Camera, The Man with a Camera, The Man With the Kinocamera, or Living Russia) is an experimental 1929 silent documentary film, with no story and no actors, by Russian director Dziga Vertov, edited by his wife Elizaveta Svilova. Vertov's feature film, produced by the Ukrainian film studio VUFKU, presents urban life in Odessa and other Soviet cities. From dawn to dusk Soviet citizens are shown at work and at play, and interacting with the machinery of modern life. To the extent that it can be said to have "characters," they are the cameramen of the title, the film editor, and the modern Soviet Union they discover and present in the film. The film also features a few obvious stagings such as the scene of a woman getting out of bed and getting dressed and the shot of chess pieces being swept to the center of the board (a shot spliced in backwards so the pieces expand outward and stand in position). The film was criticized for both the stagings and the stark experimentation, possibly as a result of its director's frequent assailing of fiction film as a new "opiate of the masses. 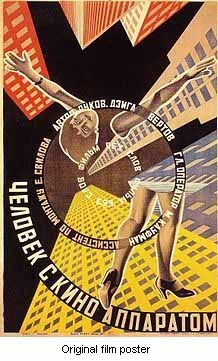 Dziga Vertov’s Soviet silent masterpiece (1929).